Seven residential high-rise buildings in four local authority areas have been found to be covered in combustible cladding following safety tests. Landlords are being told and more checks carried out, No 10 said. It comes as further tests are being carried out on about 600 high rises across England. Cladding is thought to have contributed to the rapid spread of fire at Grenfell Tower, in which at least 79 people are believed to have died. Extra checks by the fire service would determine whether the buildings were safe and what – if any – action needed to be taken, the prime minister’s spokesman said. He pointed out that a failed cladding test did not necessarily mean a building was unsafe – that would depend on the amount of cladding used and where it was fitted. Arconic, an engineering and manufacturing company, said one of its products, Reynobond PE (polyethylene) – an aluminium composite material – was “used as one component in the overall cladding system” of Grenfell Tower. “We will fully support the authorities as they investigate this tragedy,” a spokesman for the US-based firm said. 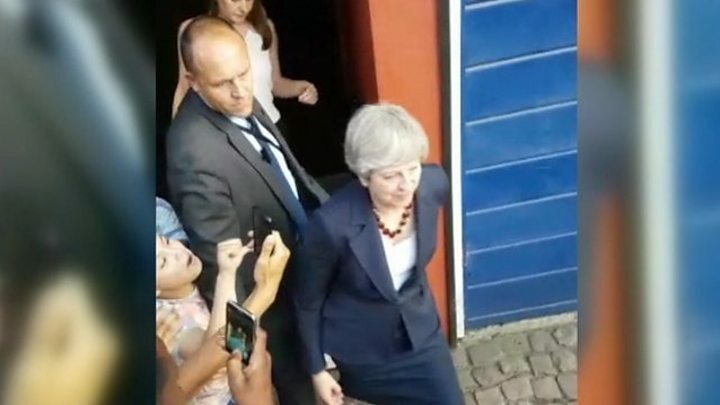 The latest test results came as new footage emerged showing the prime minister being booed after her latest visit to meet residents of Grenfell Tower. Theresa May has been widely criticised for her response to the Grenfell fire, with some people calling for her resignation. In the video taken during a private, unannounced visit on Wednesday evening, cries of “shame on you” are heard but she does not appear to respond as she is ushered into her official car by waiting security officers. In the wake of the Grenfell Tower tragedy, councils were told to give details to the government about cladding used in their tower blocks by 20 June. The Department for Communities and Local Government is now co-ordinating tests on it – with up to 100 able to take place in a day. It has written to all local authority and housing association chief executives to advise them on steps to take if tower blocks in their area are found to be clad in combustible panels. “They will be rehoused if they need to be and landlords will be asked to provide alternative accommodation where that’s possible,” she said. 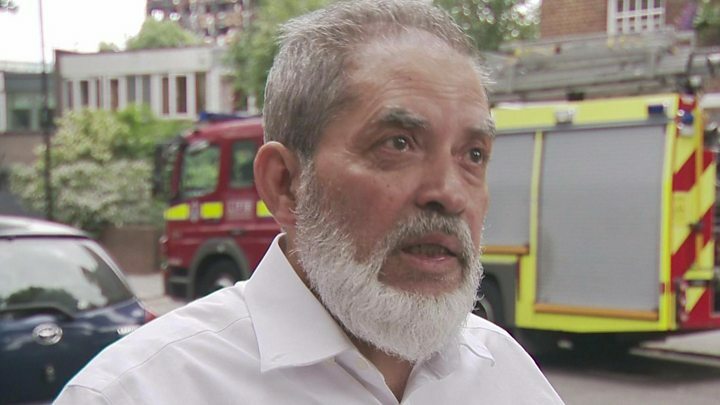 Arnold Tarling, a member of the Association for Specialist Fire Protection, said removing combustible cladding from buildings around the country could cost “hundreds of millions of pounds”. Earlier, there had been some confusion after Downing Street said 600 tower blocks had “similar cladding” to Grenfell Tower. One of the blocks found to have combustible cladding is on Camden Council’s Chalcots estate, in north London . Workmen are now removing panels found to have been made up of aluminium with a polyethylene core, said the council. Its leader Georgia Gould said the panels were “not to the standard” that the council had commissioned, and it would be informing the contractor behind the work that they would be taking legal advice. Three tower blocks in Plymouth have also been found to be clad in combustible panels, local Labour MP Luke Pollard has said. He is calling for the government to pay for cladding on the Mount Wise buildings to be “urgently” replaced. John Clark, CEO of Plymouth Community Homes, said tests showed the cladding was “aluminium coated with a polyethylene core”. He said extra fire safety precautions were being introduced, including 24/7 monitoring, additional fire protection in stairwells and checks on fire doors. 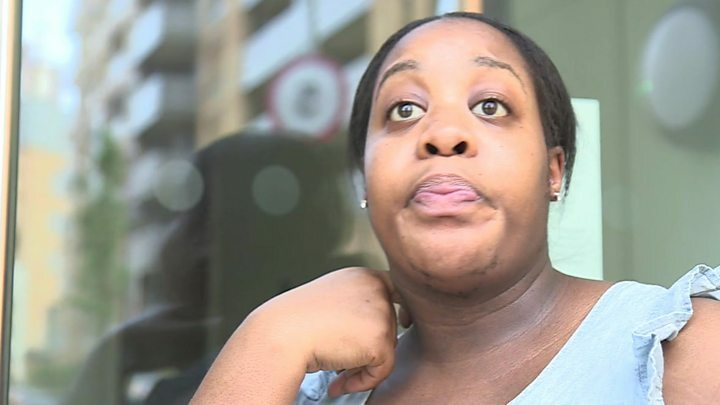 Residents at a 22-storey block of flats in Tottenham, north London, have been sent an email – seen by the BBC’s Victoria Derbyshire programme – saying the building has the same cladding as Grenfell Tower. Rivers Apartments – which is shared ownership, so classed as social housing – was built just two years ago, with the cladding incorporated as part of the design. It is understood the block is clad in Reynobond PE, the same brand of cladding believed to have been used on Grenfell Tower. The programme was told the tower passed all building regulation checks by Haringey Council. Unlike Grenfell Tower, this block does contain modern safety features, such as a sprinkler system. Newlon Housing Trust, the housing association that part-owns the block, said it had arranged with the fire service to carry out more checks. It is still waiting for final test results to confirm it is the most flammable type of cladding. It says the cladding on the building may have to be replaced. Grenfell Tower is coming to be seen as a “political symbol of inequality”, the BBC’s Iain Watson said. The new Labour MP for Kensington, Emma Dent Coad, told the Commons the “burnt-out carcass” of the tower revealed the “true face” of her constituency, with poverty, malnutrition and overcrowding existing alongside wealth. In her maiden speech, she criticised people who think social tenants have “no right to live in an area like desirable Kensington”, and called for fire service cuts to be reversed. Mrs May said she expected to name the judge who will lead a public inquiry into the fire within the next few days. “We want to ensure when the judge takes charge, people feel they can have full confidence in the inquiry,” she said. She also said that an inquiry into whether cladding in Grenfell Tower met fire safety regulations would be published in the next 48 hours. Since the Grenfell fire on 14 June, more than £700,000 has been paid out to survivors – none of which will have to be repaid, said Mrs May. Resources, including healthcare and accommodation, would be available to everyone affected by the fire, regardless of their immigration status, she added. The fire destroyed 151 homes – most in the tower block itself, but also a number of surrounding properties. Mrs May said that 164 “suitable properties” had now been found for those made homeless, and they were in the process of being checked before residents can move in. The new properties include a block of 68 flats in Kensington, bought by the City of London Corporation and allocated to Kensington and Chelsea Council. On Wednesday, the PM apologised for “state” failures following the Grenfell blaze. Later that day, Kensington and Chelsea Council confirmed that its chief executive Nicholas Holgate was resigning. Speaking in the Commons, Mrs May said the council “couldn’t cope” in the aftermath, and that it “was right” that Mr Holgate had stepped down. NHS England said that 10 patients across four London hospitals are still receiving care following the fire in West Kensington. Five of them are in critical care. One of the hospitals which has looked after patients, King’s College Hospital, confirmed it had treated three people with an antidote to cyanide poisoning – although it did not confirm whether they were given it as a precautionary measure. The 600 figure does not include Scotland, Wales and Northern Ireland, which have autonomous powers in housing. The Scottish government and Welsh ministers have said that none of their council high-rise blocks has cladding of the type said to have been used in the Grenfell Tower. Similarly, there is no evidence of Grenfell Tower-type cladding used on tower blocks managed by the Northern Ireland Housing Executive, and checks on other high-rise buildings owed by housing associations or private developers are continuing.